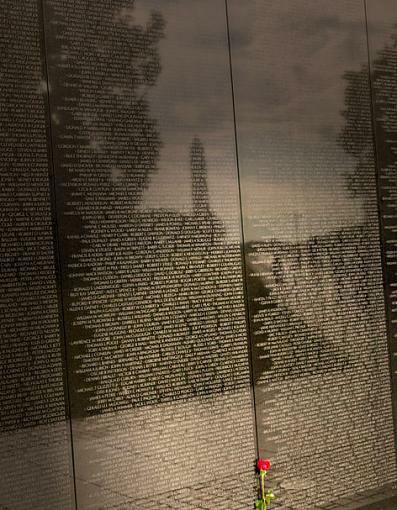 Captured this scene at the Vietnam War Memorial in DC last August. 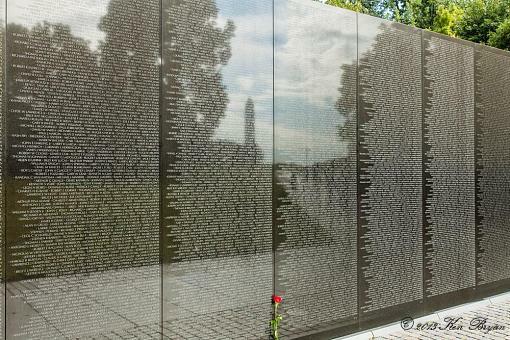 I thought it was pretty powerful, with the single rose and the Washington Memorial reflected among the names of the fallen. This one has merit Ken, but to stand out from the pack, I think you need to do a pretty tight crop to just show the flower and wall, eliminating the vanishing point effect. Just my opin, anyway Interesting tonal quality BTW. Interesting thought, GB, and as always I appreciate your input. IMO the juxtaposition of the single rose with the plethora of names is the subject, thus losing the vanishing point effect risks losing the impact of the image. Or maybe I'm not understanding your comment. Feel free to edit and post your vision here, I'd like to see it. Its been a few months since I made this shot and did the PP, but don't recall doing anything extreme...tell me more about the tonal quality comment. By tonal quality, I guess I mean I like how there doesn't seem to be a lot of contrast; nothing is blown out, even if the names are impossible to read. Also, most of the image has darkish density; this gives it an aire of mystery and/or contemplation. I tried that crop and it didn't quite come together, but I tried a few more edits, and got this ... I think it has a different mood. I think it might be important to be different with such a heavily-shot subject. Interesting on the tonal comments...I went into LR and looked at the histogram, and it runs nearly the whole gamut from left to right, with mostly high values across the spectrum. Because there is no true white or true black in the image, that may be what is conveying the odd tonality? Heck, I'm just guessing here! Having the original, I have the benefit of seeing that the names are clearly readable through the first five panels, and can still be read with a little effort in the final panel. If I was to print this image, it would beg me to print it as large as possible, because then I think the impact could be real. For on-screen or small print format, I can see some appeal in your crop. Thanks again for your input, and really for making me think more deeply about this composition.